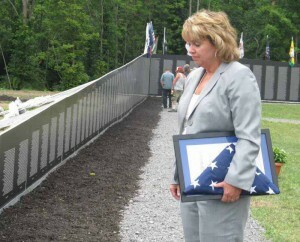 Senator Ritchie views the Moving Vietnam Veterans Wall in Mexico. MEXICO – State Senator Patty Ritchie recently attended the unveiling of the Moving Vietnam Veterans Wall in Oswego County. The wall, which was in Mexico, travels across the USA to honor those who served in southeast Asia.